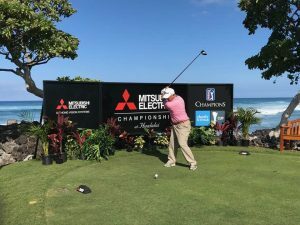 A local PGA Tour Champions golfer discusses his career and previews this year’s Masters Tournament. 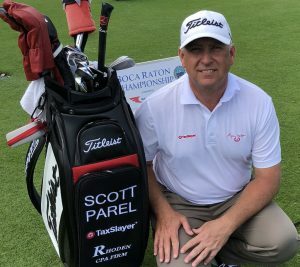 The 2018 PGA Tour Champions season is one that Scott Parel, Aquinas High School and University of Georgia alum, and his many local fans, will never forget. In a breakout season, his 11 Top 10 finishes, including four runner-ups and two victories, catapulted him to a third-place finish in the coveted Schwab Cup standings. Especially impressive was the span of 16 events to close out the season when he tallied nine of those Top 10s and his first two wins on tour. In late August, Parel captured the Boeing Classic outside Seattle in dramatic fashion. 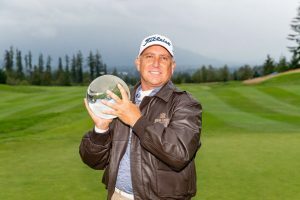 He birdied six consecutive holes on the front nine at TPC Snoqualmie Ridge en route to a final round 63. Two months later, he notched another victory at the QQQ Invesco Championship in Thousand Oaks, California. Parel took time out from his schedule to talk with Augusta sports historian, Stan Byrdy, about all things golf. Stan: Scott, you had a great year in 2018 on the Champions Tour. Are there any specific goals you’ve set for this year? Scott: Well, my goal is always to play good enough to be on this tour again next year. That’s my number one goal. So if that includes winning or whatever has to happen to stay in that top 36, I really would like to try to have a chance to win a major sometime this year. One of my goals is to be in contention a little more. I’ve only had one major in all the ones I’ve played so far that I really was in any position to win. If you win a major, you get five years of playing in a few of these tournaments. It’s not a five-year exemption, but it’s five years to play in Hawaii and a few of the invitationals. I think that would be kind of neat to do. Stan: Will you be in Augusta during Masters Week? Scott: Yeah, I’ll be in Augusta. I’ll probably go out (to the tournament) at least one day. I like being in town, I like being there. I love golf so much, and it’s the center of the universe for that one week, anyway, of the golf universe. I really do enjoy it out there. Part of the stuff I really enjoy now is not only seeing the guys I play with out here (on the PGA Tour Champions), but then seeing guys that I know like Kevin Kisner and guys that I actually played with on the Web.com Tour, like Zach Johnson and those guys. I enjoy visiting with them. And I’ll love to see Keith Mitchell, a Georgia guy that I know, so it’s always a really fun week for me out there. Stan: Many of the guys you play with have won the Masters. When you go out to Augusta National, is it a little bit different feeling for you now? Do you root for them? Scott: Oh yeah, oh yeah. I’ve made it a point since I’ve been playing on this tour to make sure I go see all the guys that I see out here every week. You know, Sandy (Lyle) and certainly Larry (Mize). Larry and I are pretty good friends, and Bernhard (Langer) and I are pretty good friends. I try and see most all of them. I know Mark, I don’t think he plays anymore, O’Meara. And José (María Olazábal), I see them out here every week, and I at least try to let them know I’m out here rooting for them. It’s a cool feeling, to be friends with these guys who people are standing outside the ropes, you know, imagining what it would be like to be their friends almost. And I’ve been lucky enough to get to know them. Stan: Wouldn’t it be nice if there was a way for you to get into the Masters at this point? Scott: (Laughs) You know, I get asked that all the time when people find out that I live in Augusta. That ship has sailed. There are ways from regular majors you can earn your way into the Masters, but the reality of that happening is obviously very, very slim. So I’ll resign myself to the fact that I’ll play out here with guys my own age (chuckles). And I’m enjoying it. Back when I first started doing this for a living and wanted to get on the PGA Tour, that certainly was the goal to someday play in the Masters. But I’m not pining over that anymore, that’s for sure. Stan: You could make a case that a lot of the seniors are playing well enough that they could do pretty well out there even in their 50s. Scott: I wouldn’t know what to predict that I could do, but I would love to have the chance. It’s a lot of golf course now. I know I’ve talked to Larry about it. You know, Couples still hits it far enough where he’s done well out there. But it’s a long thing for Larry. And it’s longer for Langer as well. But those guys have been playing that course for 30 years, so they know how to navigate their way around out there in those tournament conditions. (Chuckles) It’d be a little bit tough for me. I’d love to say I could do well, but if I were ever to have that chance, I would just try to enjoy the moment, and try not to (laughs) worry too much about what I was shooting. Stan: Do you have a feeling for who might win this year’s Masters Tournament? Scott: I just have a sneaking feeling that this might be Rory’s year. I just feel he’s been playing really good golf. And I feel his game is in a good spot right now, to where maybe this is his year. If I have to pick one person, and plus I’m rooting for him, I’d love to see him win. And it’s hard to pick against Bubba. He just does so good around that golf course. Stan: Since we’re throwing out names, what are your thoughts on Tiger? Scott: Tiger, if he’s nursing his neck, I just think it would take a lot of really good health for him to be in a spot to beat these guys at the top of their game. I know he’s proven it at the Tour Championship, but I’m not sure he’s where he needs to be yet for the Masters. I would love to see it. I think it would be great for golf. But I think you’ve got too many of the young guys right now on the top of their game. But you never know on a Sunday, with the excitement Tiger can create. (He) doesn’t put the same fear in these young guys that he used to. Even if he’s up there, I think they all feel they can handle it now. Stan: How satisfying is it now, being that you waited so long to play golf professionally, and knew you could do this, and were so close so many times, and now you’re there? Scott: (Long pause) It is very satisfying, yeah. It’s great to be able to do what I love for a living and now have some success at it, and be able to support my family in a way I always wished that I could. And then to still get to do what I love for a living. It was definitely a lot of lean years doing what I loved for a living, and it makes it that much sweeter now that I’ve had a little bit of success. You know, golf is an awfully humbling game, and it can turn on you. I’m trying to do what I’ve been doing and try to stay healthy, and keep the same attitude. Like I said earlier, do whatever I’ve got to do to keep my status out here. By not working, that’s not going to get it done. So I know I’m going to keep working hard and keep grinding away like I’m supposed to be. Published on March 27, 2019 in Guide to The Masters.